It’s the most wonderful time of the year again and I must admit it’s one of my favorite holidays. Lot’s of good will, gifts, food, and fun activities. And if you’re someone who’s throwing a celebration this holiday season, then there are plenty of great ideas! And down below, I decided to gather some awesome budget friendly and easy to do party ideas that will definitely excite and impress your guests. You can set the mood for Christmas festivities with these creative ideas without spending too much time and money. So check them out and let me know what you think. Now, If you’re looking for an easy way to decorate your party, then definitely try adding some creative balloons. Whether it’s on Etsy or in the stores, try finding balloons shaped as presents or other festive designs. It’ll make your home look stylish and it’s honestly a super easy way to decorate for the party! Just by simply creating cute Santa belts from scratch and wrapping them around red party cups, you can add some awesome decor to your food table. Every good party needs a photo booth, and props are the best way to make sure your guests can look silly and awesome in their photos. Just head on over to Pinterest and look for some super cute Christmas photo booth prop printables! They’re super easy to do! Try making a Christmas light garland for your walls by cutting up paint chips into the shape of Christmas lights. It’s a great way to dress up your walls without exerting much effort! This tip is super simple and smart. All you have to do is tape up a large rectangle of snowflake wrapping paper, and then hang up paper and plastic snowflakes to create a winter wonderland backdrop. It’s a great way to have a cute background for selfies and photo time! Another way to keep your guests entertained and busy is to have a cookie decorating station. It’s perfect for kids and adults alike! If you’re hosting a party for adults, you might want to try creating a Christmas tree appetizer. It’s fun, cute, and definitely impressive! All you have to do is create the shape of a Christmas tree using different colored grapes and cheeses. Then finish the bottom off with a short piece of celery and top the tree with anything you want! 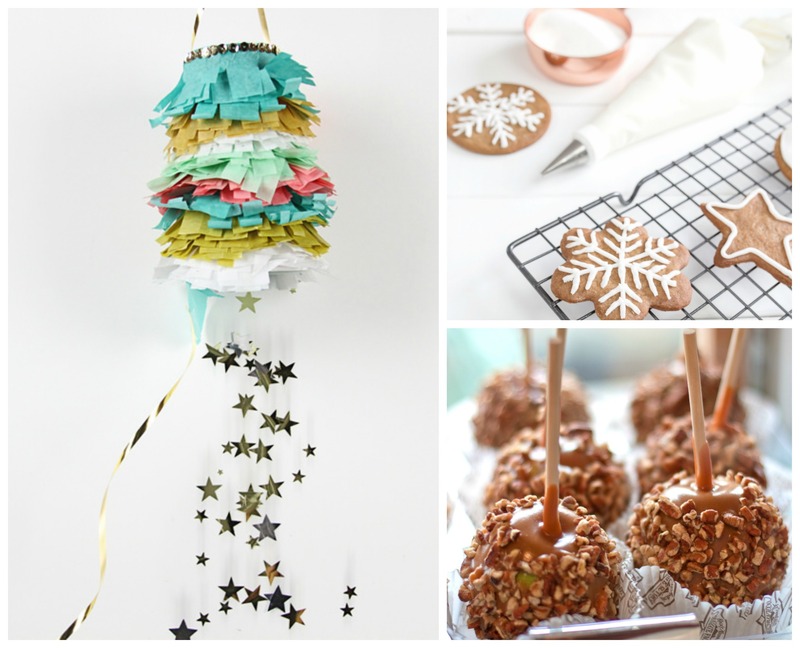 Piñatas are such a great way to make a party fun, so why not try having a Christmas inspired piñata for yours? Just check out Pinterest for a simple DIY guide, go on Etsy, or check out your local store for one! Whether you’re hosting a party for a small or big group of people, these holiday party ideas are super easy and fun. They all look great and awesome without breaking the bank. And the fun they give is totally priceless. So if you’re up for it, then definitely try these ideas out and let me know what you think.